In the Age of Myth, Sigmar the God King assembled a pantheon of gods to watch over the realms. From Sigmaron they ruled, atop the height of Azyr. But then chaos came. The pantheon fell apart, and Sigmar retreated behind the sealed gates of Azyr. And what of the mortal armies that fought in the realms for their gods? Should they retreat to Azyr, and abandon the people they had sworn to protect? One general faced this difficult choice. She had a council of warriors and sages, priests and prophets of the gods. As one they voted; where the pantheon had broken, they would remain strong. They would fight the forces of Chaos. 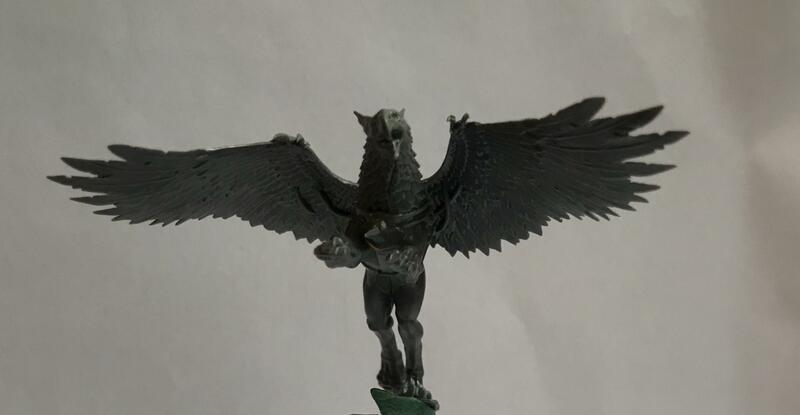 The noble Gryph-Hounds have fought beside men and women of Sigmar for thousands of years. Those that accompanied the General and were trapped outside Azyr were forever changed. Beset by foes on all sides, the General made them stronger, awakening old blood within them. They fed on the necrotic bats of Shyish, becoming something more. Taking to the skies once more, and feeding on the blood of the living, hunters of darkness. Counts as fell bats! Waaaight King With Black Axe?! There have been many champions of Gorkamorka through the ages. Thorak was a champion during the Age of Myth, and had a suit of Sigmarite armour forged by the smiths in Azyrheim, as a show of good faith from the general to her trusted weapon. Even death couldn’t stop his rampage, swearing he would fight eternally for his allies against the forces of Chaos.